← What kind of future do you want? What does it look like? There is no single way that gamification can be represented or used. Each situation is unique, which gives you freedom to organize your gamification in a way that best suits your situation. For example, the media center ladies in my last high school used Starbucks cards and homemade jellies to entice faculty to post books they were reading on their classroom walls. One year, they offered Devil’s Food Cake for the person that sent in the 666th book of the year. They gave a reward to the person that read the most books, they had a reward for the people that read the biggest books, they were creative and the staff responded. How do you start to Gamify? It’s easier than you think. First, come up with exactly what it is you want to learn. Or list some of the goals you have for your staff. Maybe there is some new technology coming along and you need to lay some groundwork first. Whatever it is, there needs to be a clear “winning” position at the end of the semester or year. With the book situation there were rewards for reading the most books or reading the longest books. What if teacher action research was something you are interested in? Or implementing pedagogically sound educational technology in your class/building? Now its time to utilize Google Apps for Education (#GAFE) and create a Google Form that can be used each time you do something that leads you toward your goal. If you are doing this for your own benefit, create a Google Sheet that tracks your progress. If you want this to be a building wide journey, use Google Forms and Google Sheets to track participant progress, then post a leaderboard in the teacher workroom. Once you have decided what the ultimate winning goal looks like, its time to develop the content that leads you there. Let’s say that you are introducing GAFE for your school or district. First, start with finding some helpful videos on YouTube ( or you can create your own). Then create some tasks and share them through a Google Doc. Finish off by having your staff complete the Google Form you created. Although this looks like a lot of moving parts (it is), when you plan ahead of time (like over the summer), there is plenty of time to set everything up. After all – the goal is to have your staff collectively moving toward an epic win! Maybe you are an individual wanting to develop a teacher blog that can become a website for your students and parents to use. Your first step is to identify a platform and open an account. Then use a spreadsheet to note this first activity. Next, set up a checklist of things you want on your blog/website and take your time. Need some help? Check out YouTube. Set some goals for yourself and as you reach a major step, enjoy a reward (that shiny new thing you had your eye on, perhaps). Above all, create a system that motivates you to check into new things or different ideas. That is what PD is for! Rewards are fun – I dare you to name somebody who doesn’t enjoy a reward. 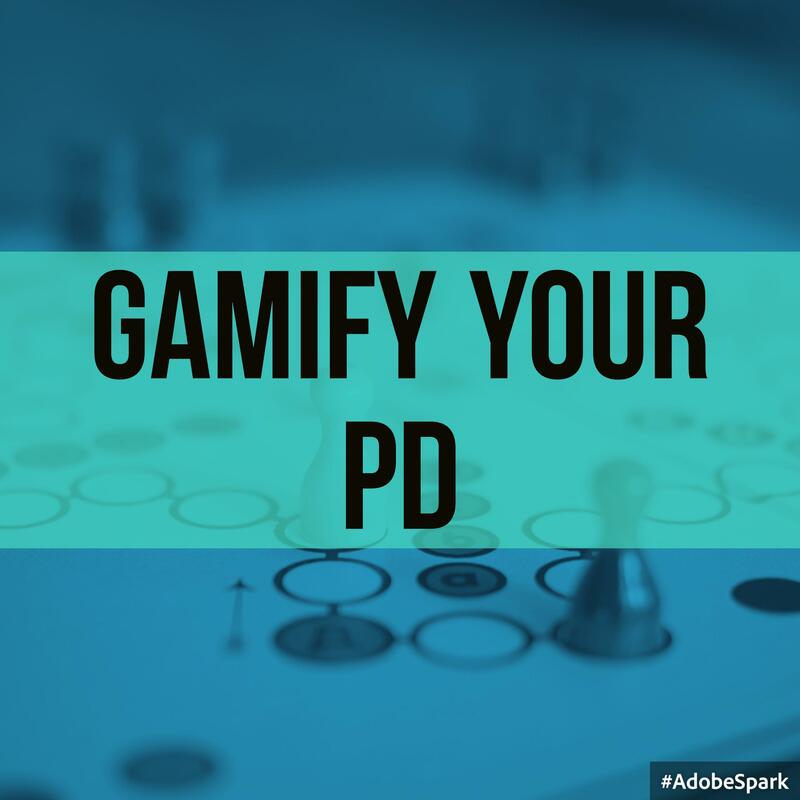 Teachers love to be recognized for going above and beyond, so tie this into your gamification system. When a teacher does something truly amazing or groundbreaking or in need of recognition – give them a reward. Maybe some fun school spirit items. Maybe a $5 Starbucks card. Maybe a super fun and totally exciting door decoration that can be displayed for all to see! Maybe a local business would be willing to donate a few things that can be used a reward during the year. If you are working on your own – figure out what would motivate you. Then, as you achieve specific milestones, reward yourself. I know a teacher who wanted to quit yelling at her own children (sometimes her students). Her epic win was to go for 30 days with no yelling at any kids. Her reward – determined when she started – was a new pair of boots. How fun is that shopping trip? Find that thing that will motivate you and when you hit your epic win enjoy that thing! Achievements happen when you knock off a series of tasks related to your epic win state. Maybe you work on your PD five days in a row. Or you have submitted 15 items to the discussion board (more than the ten required). Whatever it is, enjoy! Confused by the difference between badges, rewards, and achievements? In fact, it can be hard to determine the difference – different people define them in different ways. Whichever way you choose, be consistent and enjoy! ClassDojo – you think this is just for kids? Think again! Customize Dojo for any occasion. Replace the class related tasks with tasks that help move you toward your epic win. Habitica – determine those habits that will help you move toward your goal, then check them off as you reach them. This site gives you the opportunity to track all kinds of things: both good and bad! Similar to ClassDojo, with a more adult feel, it is easy start and has an app for your phone. Habitica also has the capability to create tasks requiring collaboration to complete. Rezzly – If you have some funds available, this is a great website to use to gamify anything you want to gamify. Rezzly uses a quest based system to move you toward your ultimate goal. Since Rezzly is the platform, you can build in all of the rewards, achievements, and badges. You can set the number of points each quest is worth. You can determine the “levels” of the players. Classcraft – Is similar to ClassDojo and Habitica – create your Avatar and set up those tasks that are important to your winning state and get going. Classcraft also has really fun ways to encourage collaboration among the participants. However, like Dojo, change some of default tasks to reflect your goals. I started working on gamifying the PD in my last high school, you can view the site here to get an idea of what I was working on. The goal was to motivate teachers to be functional with the technology they were expected to use daily, and move them toward using pedagogy to guide edtech in their classrooms. I have not updated this site in quite some time, but will show you what we were using. I am really interested in gamification and the benefits that it can have with individuals, classrooms, and schools. If you have questions on this topic, please ask me questions. I have reviewed gamification research and have used it in my classroom as well. It does look like a daunting task to take on, but use some time this summer to plan out what you need to work toward!